It was a typical evening at the Winslow house, nestled in a peaceful neighborhood in a suburb of Chicago. Carl, the head of the household, had not come home from work yet. He was a policeman for the Chicago metropolitan police force - and proud of it. Eddie, Carl's fifteen-year-old son, was in the kitchen, about to leave for basketball practice. But before he left, he just had to taste one of his grandmother's freshly baked Mississippi mud cookies. Mississippi mud cookies were Carl's mother's specialty. Eddie took a cookie right off the baking sheet. "Yeow!" he cried out. "The ones on the plate are cooler, Edward," his mother said from behind the evening paper. She was sitting at the kitchen table watching her son. But Eddie was in a hurry. "Gotta go," he said, blowing on the hot cookie. He popped it whole into his mouth before stepping into the living room. Harriette Winslow smiled to herself and shook her head. That boy sure does love his cookies, she thought. Takes after his father that way. She returned to the paper. Mother Winslow slipped the last batch of cookies into the oven. Then she turned to her ten-year-old granddaughter, Judy, who had been helping her. "Now, Judy, tell Grandma, what was the secret ingredient? Can you remember?" "Of course I can." Judy giggled as she licked the delicious, chocolaty mixing bowl. "It's mud!" Judy's four-year-old cousin Richie had claimed the big wooden spoon for himself. Richie and his mother, Rachel, lived there, too. Rachel, Harriette's "baby" sister, and Richie had moved in after Rachel's divorce. Little Richie was licking the wooden spoon like it was a huge chocolate lollipop. "Yummy mud!" he said. "It's not really mud," Judy explained to her little cousin. "It's chocolate. But the secret ingredient," she said to her grandmother, "is orange peels. See, I remember!" she said proudly. "1'll make a baker out of you yet!" her grandmother said. "Hmm - MMM." Harriette put down the newspaper, leaned back, and breathed deeply. "Every time you bake these, they smell better and better." "Why, thank you." 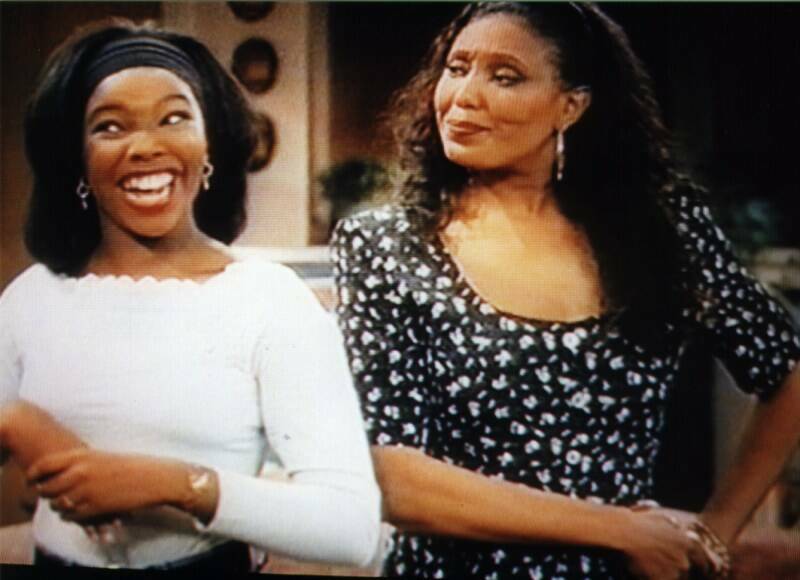 Mother Winslow smiled at her daughter-in-law. "I promised Carl if he stuck to diet for a month, I'd reward him with a plate of his favorite cookies. Harriette laughed. "Some diet!" Meanwhile, out in the living room, Laura, Harriette and Carl's thirteen-year-old daughter, was sitting on the couch painting her nails. She, too, smelled the delicious aroma as it wafted in from the kitchen. Dad must be on a diet again, she thought. Her grandmother always baked Mississippi mud cookies when Dad went on a diet. Kind of weird, if you asked her - but nobody had asked her. She couldn't complain, though, because Mississippi cookies were her favorite, too. Laura paused halfway through painting her longest fingernail and rolled her eyes toward the ceiling. Nobody else in the world had such a high, pinched, nasal voice. And it was much too loud. At times Urkel's voice sounded like a cross between a smoke alarm and a sick cow. 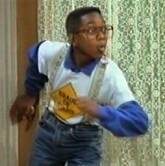 When Laura didn't say "Come in," Steve Urkel poked his head around the door. "Oh, good! You're home!" he said. 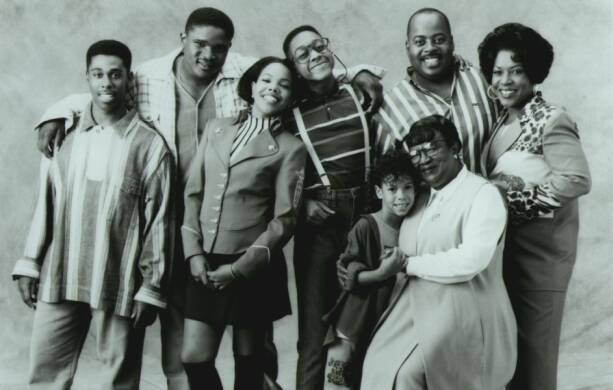 Nobody else looked like Steve Urkel. He had goggle eyes, a crew cut, and horn-rimmed glasses with a black elastic strap to hold them around his neck. Examining her nail-polish job, Laura. sighed. "Come in," she said, sounding bored. "Since I guess you're already in," she added. She wasn't exactly overflowing with enthusiasm at the sight of him. On the other hand, the sight of her couldn't have pleased Steve more. "Good fortune smiles upon me!" he declared. One of the first things people noticed about Steve were his long legs, which had grown much faster than the rest of him. They made him look more like an eight-year-old walking around on stilts than the fourteen-year-old that he was. And it was certainly true that nobody -but nobody- would dream of dressing like Steve Urkel. He wore clunky saddle shoes, white socks, a varsity sweater, and gray dress pants with red suspenders that hitched them up, as always, almost to his armpits. "That nail polish is the perfect shade for you, my dear," he said. "Thanks, Steve," Laura said dryly. Yes, he was Steve Urkel: Wiz Kid, child prodigy, class-A nerd. And every once in a while, Laura didn't like to admit, he was a good friend. But tonight ... well, tonight, she just wasn't in a Steve Urkel kind of mood. She was, if the truth be told, in a Greg Hudson kind of mood. Greg Hudson was the best-looking boy in school. "Here it is Friday night and a delightful creature such as yourself is actually at home!" Steve said. Laura finished applying polish to her pinkie fingernail and blew on it. "I'm home," she told him. "But don't get your hopes up. If Greg Hudson finishes studying for his algebra test, I'm outta here. He said he'd take me to see the new Halloween Street movie. "Part IV?" Steve shuddered. "I avoid horror movies myself. They horrify me beyond my capacity to cope." Laura stared at him. She didn't see why Steve had to speak like he was a walking college dictionary. He translated for her benefit: "What I mean is, horror movies scare the living daylights out of me." Laura smiled knowingly. "Me, too. But not with Greg Hudson by my side." Steve let loose with one of his usual snorts. "The very idea of your placing yourself at the beck and call of that ... that-" "Hunk?" Laura finished for him. She screwed on the lid of the nail-polish bottle. "What's he got that I haven't got?" Steve whined. Everybody knew that Steve Urkel's crush on Laura Winslow was harder to kill than the zombie maniac in Halloween Street, parts I through IV. "What's he got that you haven't got?" Laura answered. "Try looks, for starters." Steve scoffed. "Money," Laura threw in. Steve thought about that. "And how about a personality that doesn't drive me clear up the wall and down the other side?" she added for good measure. Steve nodded his head firmly. His eyeglasses caught the light and flashed. "Very well put, my dear. But I can dream, can't I?" He gave her a puppyish look. Not as far as I'm concerned, she thought. Just then, Laura's aunt Rachel bounded down the stairs. She held out a pair of long, heavy gold bangle earrings. "Hi, handsome!" Rachel said to Steve, who was now lounging on the couch, making himself at home. Rachel sidestepped his long legs to get to Laura. For some bizarre reason, grown-ups - the female kind in particular - seemed to like Steve. Laura couldn't figure out why. Maybe it was because he was sort of an old fashioned goody-goody. "These are, the earrings I was telling you about," Rachel said to her niece. "They'll go great with your new green sweater, don't you think?" "They're gorgeous!" Laura said, taking the earrings. She was lucky to have a young, cool aunt living under the same roof with her. It was almost like having a big sister. Especially when it came to borrowing things. "And you'll really let me wear them?" "For a date with Mr. All-Right, you've got to look Dyn-o-mite," Rachel said, grinning. "Besides, now that you've got your ears pierced, I've got lots of earrings you can borrow. But don't you go and lose these now or I'll be all over you like a bad case of German measles." "Don't worry, I won't," Laura assured her aunt. The earrings really were pretty. Steve, who made Winslow business his business, peered critically at the earrings in question. "Losing those would be like losing the Washington Monument in a haystack," he pronounced. "Are you sure you want to burden your delicate lobes with those wrecking balls?" Laura ignored Steve. Just like she did most of the time "Can I try them on?" she asked her aunt. "Of course." Rachel led Laura over to the nearest mirror. "The wires are pretty thick, so go easy threading them through your earlobes." Steve crept over and watched. He made a face. "Why you women feel obliged to punch holes in your ears in the name of beauty truly mystifies me," he said. "Ouch!" Laura winced. "They're kind of hard to get in. I guess my holes aren't completely healed up yet. The lady who pierced them said sometimes it takes a little time for them to toughen up." Rachel nodded. "She was right about that. See? You're bleeding a little." "Blood!" Steve shrieked. Laura and Rachel heard a crash They turned from the mirror and blinked in surprise. Steve had keeled over in a dead faint. "Gee," Rachel declared, "for a surgeon's son, that boy is mighty squeamish."